The 10 Best State Parks in South Carolina! South Carolina’s state parks are one of the best ways to spend a day, and there’s never any shortage of things to see and do. From exploring waterfalls and hiking trails to geocaching to water sports and camping, the state parks here are paradise for every outdoor enthusiast. Spend some time at these 10 best state parks in South Carolina and enjoy escaping back to nature. Tucked in the SC mountains, this state park is a place of solitude and serenity. 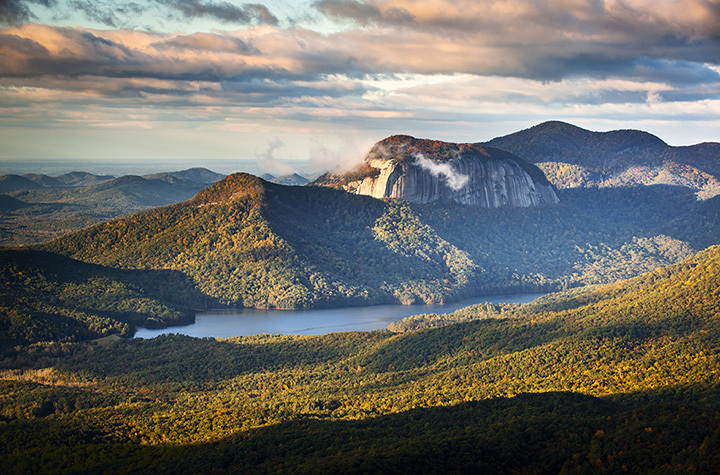 The park features a complex trail system, some of which connect to neighboring Caesar’s Head, so you can roam for miles in this beautiful wilderness. The park features some of the best trout fishing the state, along with camping, waterfalls, ecology center, and bird viewing. Steeped in history and rich in wildlife, there’s no better way to experience nature than right here. Inside the park are historical buildings to explore, as well as freshwater and saltwater habitats that are home to alligators, birds, turtles, and other wildlife. Known for its beautiful bare mountain facing that rises like giant among the trees, Table Rock State Park is a hiker’s dream come true. Camping opportunities and an old-fashioned swimming hole attract visitors of all ages, plus there’s no shortage of trails to suit a variety of skill levels. Make it to the top of Table Rock for one of the most breathtaking views in the state. Another hidden mountain gem, this state park is the only direct public access to glistening Lake Jocassee. Surrounded by mountain and lake views, the park offers fishing, camping, and hiking trails where you can see the endangered Oconee bell wildflower. The lake is also the best place in the area for scuba diving, and you might just stumble across a old sunken city while you’re there. Known for its hiking and camping, Oconee State Park is a family-friendly adventure any time of the year. It offers direct lake access, plenty of fishing, mini golf, and a full activities calendar during the summer that even the most budget-conscious families can take advantage of. The views here are beautiful, too, giving you the best of both mountain and waterfront scenery. History lovers and outdoor enthusiasts alike will love a trip to Kings Mountain State Park. Known for their living history demos, fishing, hiking, and its equestrian trails, you’ll want to spend more than a day exploring here. They’re also in close proximity to Kings Mountain National Park, home of a revolutionary war site. The rolling terrain of this state park makes it a prime destination for mountain bikers. Once the site of an army training base, the park now offers visitors equestrian facilities, hiking and biking trails, and a sprawling lake for fishing and kayaking. Admission to this park is a bit lower than most of the others—just $2 for adults and $1.25 for SC seniors. Kids 15 and under are free. With plenty of trees and greenspace, it’s hard to believe you’re just a stone’s throw from downtown Columbia. This picturesque retreat offers camping, hiking, biking, a small lake, a dog park, and no shortage of Insta-worthy spots. It’s the breath of fresh air every big city needs, and will easily become your new go-to escape. This park is a freshwater fisherman’s hotspot, offering some of the best places to catfish in the state. Cabin and tent campsites and miles of hiking and biking trails give you plenty of reason to extend your visit. Admission to this park is attractive—just $2 for adults and $1.25 for SC seniors. Kids 15 and under are free. For easy hiking trails and waterfall viewing, you’ll want to make this park your first pick. They have trails to suit any hiker’s skills, with plenty of rewarding views along the way. Also in the park are paddleboard and canoe rentals, historic sites to explore, and a small lake perfect for fishing. View more South Carolina Parks.